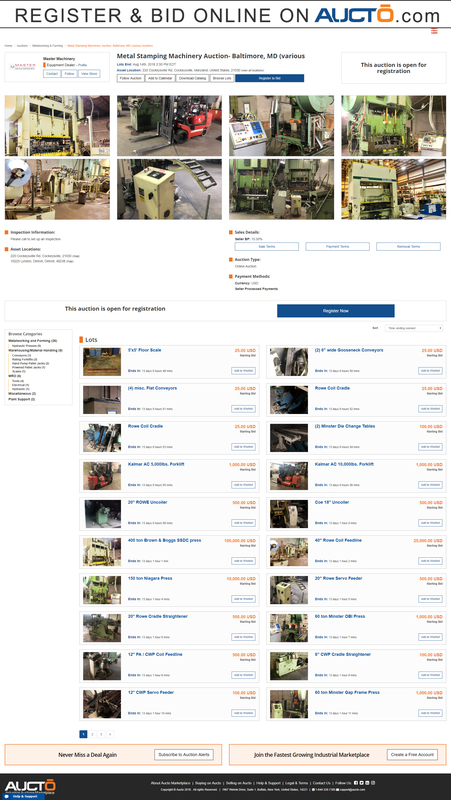 Metal Stamping Machinery Auction - Various Locations in Cockeysville, Maryland by Aucto Inc.
All payments shall be by way of cash, certified check, wire transfer or a company check accompanied by a bank letter or guarantee payable to Master Machinery. All biding and invoicing will be in US Dollars. All bidders are responsible for applicable taxes. Buyers are fully responsible for all rigging and transportation costs and must be complete by the designated auction removal date. Rigging/removal may not begin until payment has been made in full. All rigging companies must be approved by Master Machinery. All rigging companies must provide proper and necessary insurance documentation to Master Machinery before the removal of any items from the auction site. ALL SALES ARE FINAL. Items are Sold “AS IS – WHERE IS”, “IN PLACE”, “WITH ALL FAULTS”. A 15% Buyer’s Premium will apply to purchases for this Auction.